Today is Smeared Ink Day which means we are challenged to use only Smeared Ink images in our creations! So I used Smeared Inks' 'Thinker - As Death' image and created this Creepmas Santa card. The image was stamped with Tuxedo Black Memento ink and coloured with Prismacolor pencils. The sentiment was stamped with Rhubarb Stalk Memento ink. The panel edges were distressed with Tim's distresser tool and edged with Fired Brick Distress ink. I applied Snow marker puff paint to Skellie Santa's outfit and once dry activated the puff paint with a heat tool. I then embossed an entire folded card with a snowflake embossing folder by Cuttlebug. The card edges were distressed with the distresser tool and edged with Fired Brick Distress ink too. Then wrapped red/white baker's twine around the front and poked 3 holes in the spine for the twine to thread through and finished with a bow. 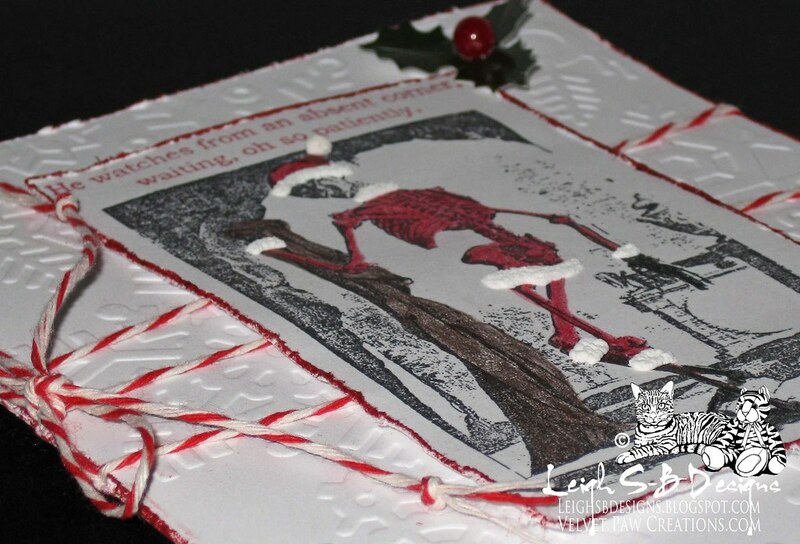 The Skellie Santa panel was then adhered to the card with 3D glue dots. I completed my story with a Dymo Buddy label maker and red tape and embellished my card with a holly sprig saved from a previous year's Christmas cake! awesome art. love the crispy white look. wonderful card-thanks for joining us at Sparkle and Glitter-good luck! Oh my gosh...so creative. Good job altering the skellie into a creepy Santa. Love everything about the card! Your skeletal Santa seems to have missed a few meals! Perhaps that's what he's waiting for!! Thanks for joining us at Sparkle and Glitter!! Love the red and the addition of the fluff to turn the image into Santa. Clever! thanks for joining us in Sparkle and Glitter. Ack! 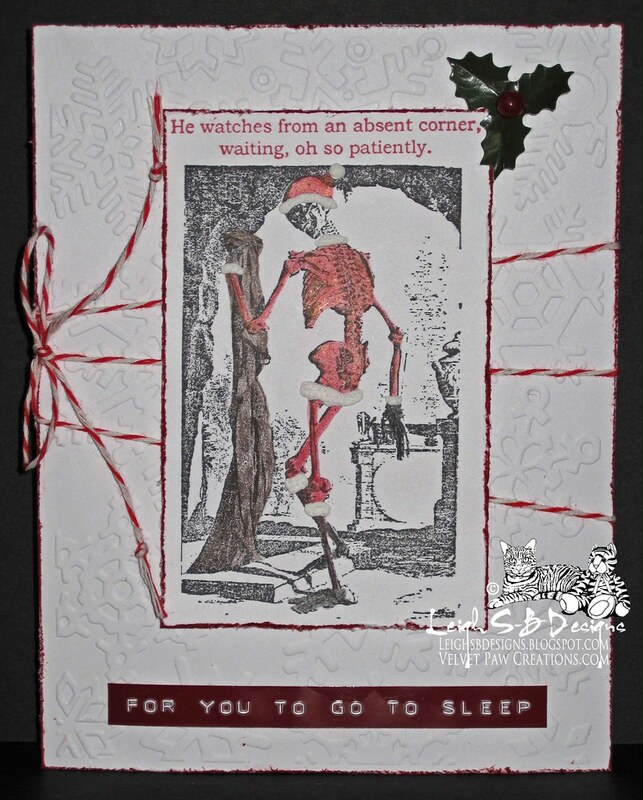 What a fabulous idea making him a santa skeleton, love this card! Love the red and white theme...so cool! Excellent work! I love the bakers twine! Fab creepy Christmas creation! Thanks for sharing your talent. Love the snowflake background, dimensional trim, and great embellishment! Thanks for joining us for the Simon Says Stamp Challenge!